Dorothy Ray Healey was a leading California Communist Party USA member-later active in the New American Movement and Democratic Socialists of America. She died in 2006 in Washington DC age 91. Healey was born on September 22, 1914, in Denver, Colorado, as Dorothy Harriet Rosenblum. Both of her parents were Jewish immigrants from Hungary: her father worked as a traveling salesman and her mother was a Socialist Party USA activist who became a charter member of the Communist Party USA in 1919. Her family moved to California in the 1920s, settling in Berkeley, where Healey attended high school. In December 1928 at the age of fourteen, that she joined the Young Communist League USA . . Her first arrest for political activity came on May Day, 1930, at a Communist-organized demonstration of the unemployed in Oakland; she was sent to the juvenile detention home in Oakland for two weeks, where she adopted the pseudonym Dorothy Ray to protect her father's job. At the age of 17, Healey dropped out of school to organize cannery workers and later, agricultural workers. By 19, Ray was leading a strike of Mexican agricultural workers in Imperial County, for which she did 180 days in jail. By 24, she was an international vice president of the Cannery Workers Union and at 25 the head of the Labor Non-Partisan League–the CIO political operation in Los Angeles. Dorothy Healey became chairman of the Los Angeles Communist Party USA in the late 1940s. By the mid 1950s Dorothy Healey had become a "local celebrity", appearing on radio talk shows, and hosting her own show on KPFK. In 1966 she ran for county assessor on a platform of linking property-tax rates to homeowner incomes and won 86,000 votes. According to DSA colleague Harold Meyerson Dorothy Healey was probably the most compelling and attractive spokesperson the American Communists ever had. When the Soviet Union invaded Czechoslovakia in the summer of 1968, the national party supported the invasion; the L.A. party opposed it. Dorothy had the bitter experience of seeing many of the ’60s activists she’d recruited to the party – Angela Davis in particular – side with the national party’s ossified Stalinist leaders. In the early 1970s, Dorothy Healey, Ben Dobbs and a group of their former California comrades, including housing and civil-liberties activist Frank Wilkinson and attorneys Ben Margolis and John McTernan left the party -later to join the New American Movement and eventually Democratic Socialists of America. Dorothy Healey, John McTernan and Ben Margolis were all in the same Southern California New American Movement branch with Paul Jarrico and Bill Jarrico. Early in 1974, expelled former CPUSA Callfornia DIstrict leader Doroth Healey formed a group of some 70 "socialists in search of a party" and took them into NAM as one of its strongest chapters. In the late 1970's Dorothy Healey was a Los Angeles California, contact for the New American Movement. In 1981 Dorothy Healey, LA NAM; Rick Kunnes, National Secretary; John Cameron, Co-Chair, Energy Commission and Susie Deter Shank, Detroit NAM spoke on a mini-plenary entitled National Strategies, National Coalitions at the 10th Convention of the New American Movement. The convention was held in a union headquarters in Chicago and ran from July 29 - August 2, 1981. Photo by Scott Van Osdol, NAM convention 1981. On Sunday, June 7, 1981, the Los Angeles Chapter of the New American Movement sponsored a Tribute to Ben Dobbs for "His lifelong commitment to socialism". The event was held at the Miramar-Sheraton Hotel, Santa Monica, California. At the event Dorothy Healey and Jan Breidenbach performed a song entitled "As We Know Him". Healey was also listed as a sponsor of the event. 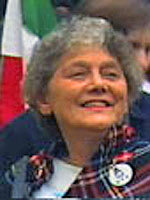 In 1982 Dorothy Healey was a committee member of the Socialist Community School in Los Angeles. She was also a teacher at the school in the 1980s. In the 1980s Dorothy Healey was a speaker on the The Crisis of Capitalism section of the NAM Speakers Bureau on the subject of The Struggle for Socialism Today. She was also a speaker on the The Left & People's History section on the subject of Socialist Struggles from the '30s to the '70s. In 1982 Dorothy Healey was on the Advisory Committee, KPFK radio commentator, of Los Angeles Democratic Socialists of America. In 1985, Dorothy Healey Pacifica Radio Commentator and DSA National Vice-Chair, served on the Advisory Committee of Los Angeles Democratic Socialists of America. In 1985, Ex Officio members: Barbara Ehrenreich, Dorothy Healey of Washington D.C., Frances Moore Lappe, Hilda Mason, Marjorie Phyfe, Christine Riddiough, Rosemary Ruether, Maxine Phillips and Esmeralda Castillo were listed on the National Officers and Staff of the Feminist Commission of the Democratic Socialists of America. In 1992 Dorothy Healey of Washington DC endorsed the Committees of Correspondence national conference Conference on Perspectives for Democracy and Socialism in the 90s held at Berkeley California July 17-19. In 2003 Dorothy Healey was on the Advisory Board of the Rosenberg Fund for Children. This page was last modified on 30 July 2018, at 08:06.